Sketches are a great way to get the creative juices flowing. They provide a template to help you construct aesthetically pleasing pages but are also very flexible. You can rotate them, reverse them, change elements, leave out or add features - anything to make it your own. In this article, Susanne gives us her take on one of the Stickers 'N' Fun sketches from July 2006. 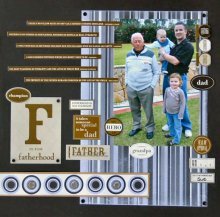 This layout was created using DCWV BL&W Words Stripes paper, DCWV BL&W Geometrics Circles paper, black Bazzill cardstock, tan Bazzill cardstock, black brads, black eyelets, clear rhinestones, sanding block and 7Gypsies Fatherhood stickers. Use black Bazzill cardstock as the background. Cut a piece of DCWV BL&W Words Stripes paper measuring approximately 17.5cm x 27cm. Distress by sanding the edges and front of the paper with a sanding block. Adhere vertically to the right side of your page. Attach sticker tabs to your photo and then mount photo in top right hand corner of the DCWV BL&W Words Stripes paper. Set black eyelets in four corners of DCWV BL&W Words Stripes paper. Cut one row from DCWV BL&W Geometrics Circles paper to a length of seven circles. Mat with tan Bazzill cardstock. Adhere rhinestones over circles with white centres. Attach to the bottom left hand side of black cardstock just above level of eyelets. Apply a selection of "Fatherhood" stickers to layout as shown. I have trimmed some of the sayings to achieve an overall balance in the length for their positioning on the layout. Fix black brads to the three exposed corners of the "F is for fatherhood" block. Finally, fill in "Limited Edition" and "Created with admiration by" tabs.